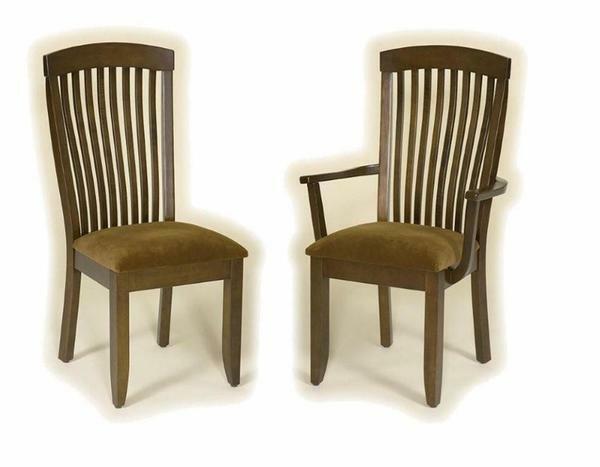 The Amish Furniture Empire Dining Chair displays shaker style furniture for your dining room. This simple, functional shaker dining chair avoids any frills that might detract from the beauty of its basic design. This chair back flows gracefully as it supports you during meal times and dining room gatherings. Eight modest width slats curve ever so slightly to form this exquisite dining chair back. The legs are thick with the front legs exhibiting a slight taper. Review different types of dining room chairs in our helpful blog post, "DutchCrafters Ultimate Guide to Choosing the Perfect Dining Room Chair." With Amish made furniture comes the option to customize. Select from seven different wood types to handcraft your Empire Dining Chairs as well as the stain you like best. Consider a wood, fabric or leather seat to keep you comfortable as you dine. Enjoy browsing our collection of Amish Dining Room Chairs and contact us with any questions, toll-free at 866-272-6773. We are always happy to help. Arm Chair Overall Width: 22 1/8"